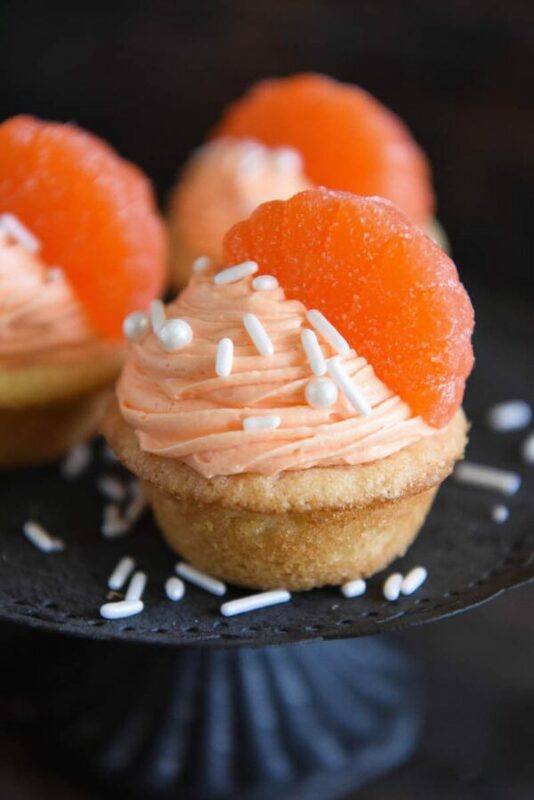 Orange Creamsicle Cookie Cups: soft sugar cookie cups are filled with a vanilla orange whipped buttercream creamsicle icing and topped with orange candy wedges. 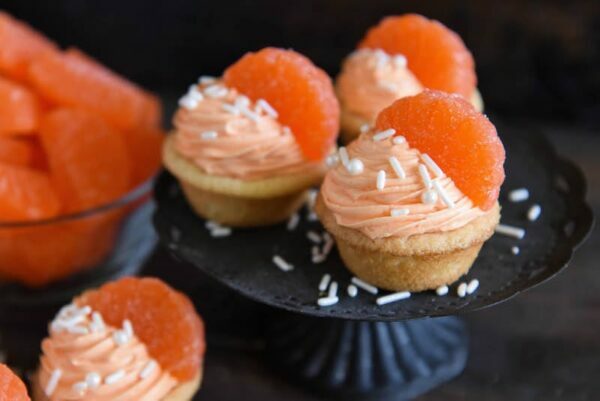 How adorable are these Orange Creamsicle Cookie Cups? They just scream summer to me. One of my all time favorite ice creams to get from the ice cream man growing up was a creamsicle bar. The icy cold fruit flavored outside and the creamy vanilla center was always so dang good. I’m really sad that we don’t have the ice cream man here in Florida like we did in Texas. Growing up we had THREE ice cream trucks that would do trips around the neighborhood daily. But since moving to Florida, an ice cream truck is incredibly rare to spot. I’m sad that my girls will probably never know the joy of hearing that music and rushing to beg your mom for a dollar or two. Then running as quickly as you could to hopefully catch the ice cream truck before it left your street. Then euphoria when you actually caught it AND got your sweet frozen treat. Ugh, it was the best! Lucky for my kids, when the hotter months roll around (which is almost every month in Florida), we take a stroll down the aisles of the ice cream aisle at the grocery store. A couple weeks ago Lyla picked Orange Creamsicle popsicles. I was secretly thrilled with the choice. We all had one, while swinging in the backyard, as soon as we got home and I remembered just how good they were. I knew then I wanted to create some kind of fun dessert that was Creamsicle flavored. I first thought of a pie and then remembered I had already made a No Bake Creamsicle Pie! 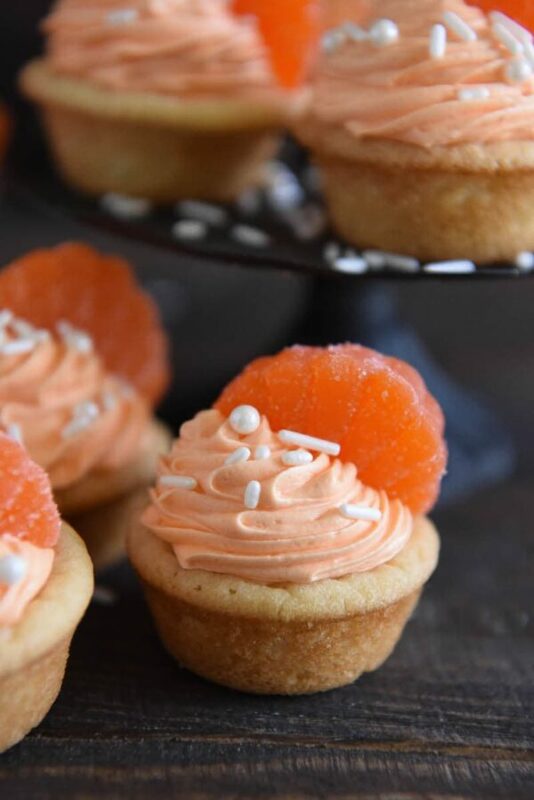 So for something new and fun, I thought of Orange Creamsicle Cookie Cups! The base is a sweet classic sugar cookie that you bake in a mini muffin tin. 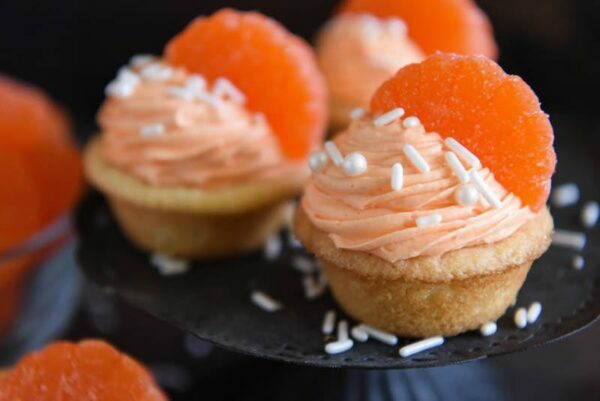 Fill the center of each cookie cup with a vanilla orange creamsicle buttercream and then top it with an orange candy wedge. I added some sprinkles for an extra pizzazz, but that is totally optional! 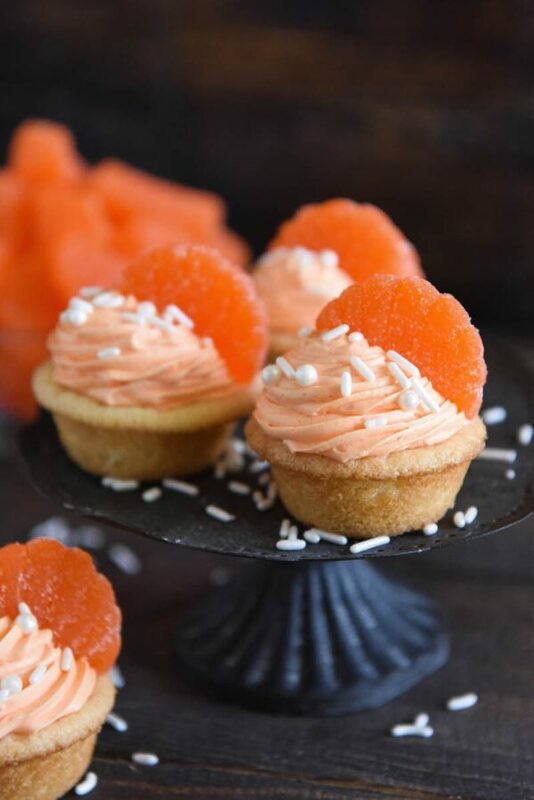 These Orange Creamsicle Cookie Cups are as adorable as they are easy to make. The older I get the shorter my attention span gets!! I saw your recipe for creamsicle*cookies but I saw the pie recipe first. After drooling as I read the recipe I saw a recipe for chocolate milk pound cake!! As I was about to move on there was the pic of the cookies, the real reason I was on the page. *you can’t use the name but we all know it’s creamsicle!! What? an orange piece on cream no man what the taste of this? I think it’s not a good combination but As I like you and your all recipes so I’ll try to make this one soon and then I’ll check why you share this with us….